pseudoparanormal: Magnet Therapies are Bogus! Almost all of us have now seen people and businesses that claim their magnetic devices relieve pain and have therapeutic value against many diseases and conditions. It is said that the magnetic fields from these bracelets, headbands, back braces, etc., increase circulation, reduce inflammation, and provide speedy recovery from injury. However, these claims are not supported by any experimental evidence whatsoever. Many scientists have conducted double-blend, placebo-controlled studies involving groups of people experience pains throughout there bodies. I looked at three different studies, all of which concluded that the group with the real magnets did not show better results than the control group with fake magnets. 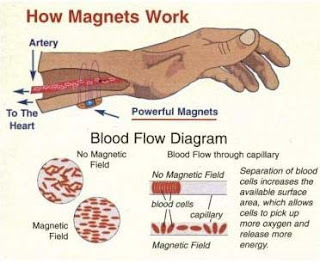 Scientists also say the claim of improved circulation is completely false because if it were true, placing the magnet on our skin would cause the area around the magnet to become red. Studies have also been performed in which blood flow was measured. There has never been a case in which they found a change in the speed or amount of blood flow. You will find after some research that most companies that produce magnetic items are subject to regulatory actions, meaning they are making false claims. Because these companies cannot prove their products can cure or treat disease of pain, they cannot advertise these claims. Fortunately for these companies, there are people out there who actually believe this stuff works. I got a good laugh out of this website. They even sell magnetic products for your pet such as collars and a large pet pad.